Jennifer Hirsch from Cape Town, South-Africa presents her book about modern chirology. Learn how to decode fingerprints + how to-do hand reading. A detailed review!! 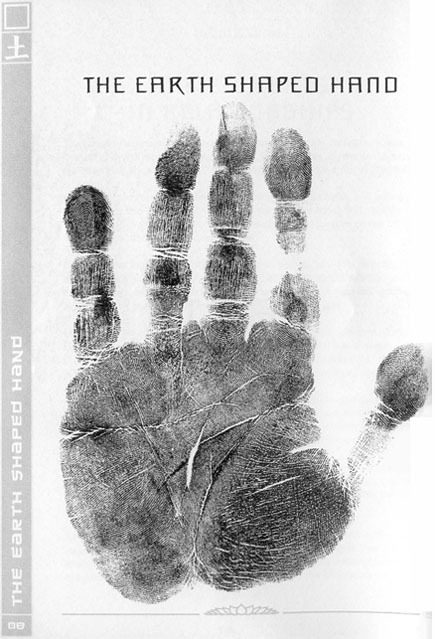 Jennifer Hirsch - founder of the Chirology Center of South Africa - began her study of hands in 1991 and has pioneered hand reading in South Africa since then. In 2004 she started working on the book devotedly, and in 2009 she officially presented her self-published book - titled: 'God Given Glyphs'. An authentic pioneering book in the field of hand reading, which has been recognized by fellow (elemental) chirologers as a new milestone in the history of chirology! First impression... an authentic, dedicated, well written book about modern (elemental) chirology; featured with a beautiful 3-dimensional cover (you can actually 'feel' the fingerprint), plus many high quality illustrations of fingerprints & palmar dermatoglyphics. Including quite a few references to scientific research! And a very extended useful glossary (covering 16 pages), a bibliography + a detailed index (covering 14 pages). Let's take a closer look at the content! First, this review will describe the postion of 'Five Element Chirology' in the field of classic hand reading (chirology). Second, the '5 ELEMENT hand model' will describe the theoretic framework behind 'Five Element Chirology'. Third, an introduction about the core of the book: the palmar- & digital dermatoglyphics - the GLYPHS! And finally, a brief description of some other interesting aspects of this book. • 4 - What else has 'God Given Glyphs' to offer? "The term 'chirology' describes the collective global body - both ancient and modern - of all facets of the knowledge and study of the forms and markings of the human hand. Consequently, there exist today various other Wester and Eastern systems of chirological hand analysis, including traditional European palmistry." At her website godgivenglyphs.com Hirsch explains a few more details by describing that hand reading can be recognized a 'craft' of which the historic roots were brought to Europe by Romany Gypsies - who's blood line traces back to India. The unique character of 'Five Element Chirology' - when compared to other Western and Eastern hand readings system - lies in it's origins that relate to ancient Buddhism. "The system is based on 'the principle of graduated materiality', a concept describing how the elements earth, water, fire, and air issue forth from the 'fifth element' chi. The theory holds that the elements manifest in an internally expanding progression, from dense (earth) to intangible (air), symbolicaly representing the evolution of human consciousness from ignorance, greed and hatred towards wisdom, compassion and enlightenment." 'Five Element Chirology' describes how the 5 elements can be studies through the shape and features of the hands. Inside the book 'God Given Glyphs' Hirsch suggests that the concept 'Chi' represents the 'fifth element' in Buddhism, and at godgivenglyphs.com we can see that Hirsch uses an underlying assumption where she suggests the concept 'Chi' to represent the equivalent of the (5th) element 'ether'. Unfortunately, this assumption is in contradiction with Buddhist philosophy. Actually, the term 'Chi' (a.k.a. 'Qi') has it's origins in Taoism (not Buddhism), where it represents the so-called "life force" - which is described to have no manifestation of its own and therefore it should never be assumed to represent one of the five elements (because all five elements do have manifestations on it's own); while the term 'ether' has it's origins in classic Greece/Western philosophy where it represents the 5th element which explicitly described to have a manifestation on it's own (e.g. originally associated with: space, emptiness, voith, vacuum, sky, heaven; later it became associated with: gravity & light - which still is according modern science today). In Tibetan Buddhism the human body is described to consist of two parts: (1) a coarse body made of six constituent elements (earth, water, fire, wind, space and consciousness); (2) a subtle body, or 'Vajra body', of energy-winds, energy-channels and energy-drops; inside this subtle body 'sog lung' (vital breadth) is considered the most important wind (or 'subtle breath') that moves along the invisible channels of the subtle body - 'sog lung' represents: "the essence of life itself that animates and sustains all living beings". So, the equivalent of 'Chi' in Tibetan Buddhism is 'sog lung', which is recognized to be closely connected with the primary element wind (in other philosophies this element is associated with the primary element air); this indicates that 'Chi' is likely more closely connected with air (and should not be used to replace ether). Interestingly, scientists from China have recently claimed to have found evidence for the modern hypothesis that 'Chi' actually most likely represents the chemical element Oxygen [O] - which perfectly makes sense, because according modern science today Oxygen is recognized as the 'vital' part in the air that we breath in order to stay alive! Breathing goes via the lungs, which reminds us of the term 'Sor Lung' that is used in Tibetan Buddhism (which also confirms the connection with the element air); however, modern science describes that the chemical element Oxygen is not present in ether - because ether actually does not contain any matter at all. These considerations according multiple perspectives indicate that there is no solid basis to use 'Chi' as a replacement for ether. • (6) 'Qi' in Chinese Taoist philosophy, where the 5 elements are named (Mahabhuta): earth - water - fire - wood - metal. PICTURE: The well-known 'Five-Element Stupa' symolizes the 5 Buddhistic elements; 'Five Element Chirology' describes how each of the elements relates to the 5 fingers. 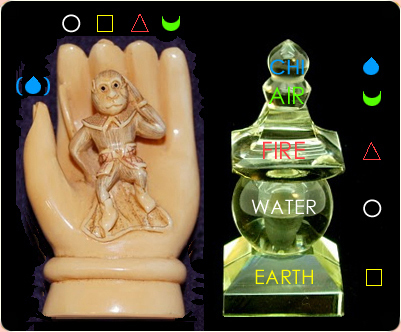 In 'Five Element Chirology' each of the Buddhistic elements becomes manifest through certain hand characteristics; even though 'chi' has no manifestions of it's own Hirsch associates it to relate to the thumb (at godgivenglyphs.com it becomes apparent that this associaton is made through the fifth element 'ether'). "...The theory holds that the elements manifest in an eternally expanding progression, from dense ('earth') to intangible ('air'), symbolically representing the evolution of human consciousness from ignorance, greed and hatred towards wisdom, compassion and enlightment." Wikipedia presents more details about the concepts behind the classic elements in various philosophies. NOTICE: One should be very aware not to confuse the 5 Buddhistic elements with the 5 Chinese Taoist elements ['earth', 'water', 'fire', 'wood' and 'metal'], nor the 5 elements from the Hindi philosophy ['earth', 'water', 'fire', 'air' and 'ether']. 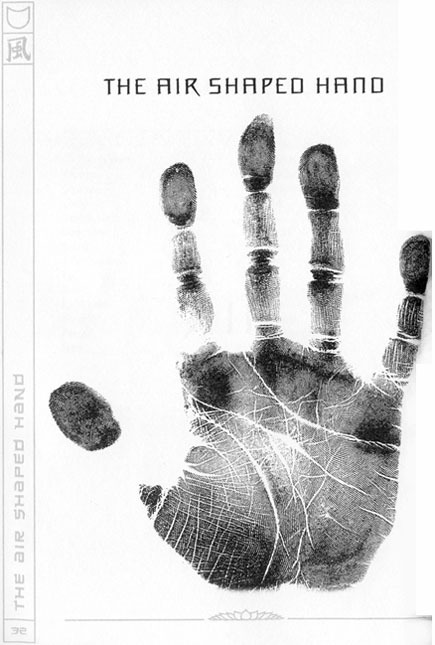 Hirsch has devoted about 1/3 of 'God Given Glyphs' on the fingerprints (the so-called 'digital' dermatoglyphics), and 1/3 on the palmar dermatoglyphics. 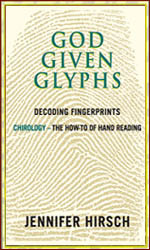 In the longest chapter of the book - The Fingerprint Patterns - Hirsch presents an elemental interpretation of 7 basic fingerprint types (in respective: the 'arch', 'ulnar loop', 'radial loop', 'tented arch', 'whorl', 'double loop' and the 'peacock's eye') is given for each individual finger. Followed with an elemental interpretation when each of the 7 basic fingerprint types is relatively dominant. 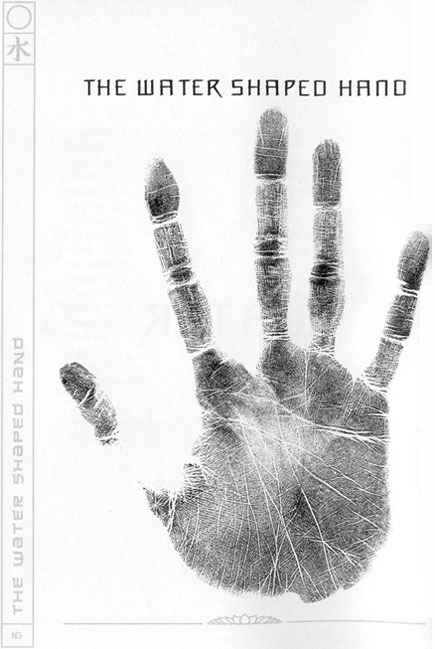 Because the 'ulnar loop' is the most common fingerprint type, only the presence of 10 'ulnar loop' fingerprints can be recognized as a truely dominance of this fingerprint type. The 'whorl' is also relatively common, when 6 or more 'whorl' fingerprints are present in a pair of hands then this pattern can be recognized as the dominating fingerprint type. The other types are far less common, and the presence of 3 or more of the same type (of the other 5 fingerprint types) can be recognized as significant. 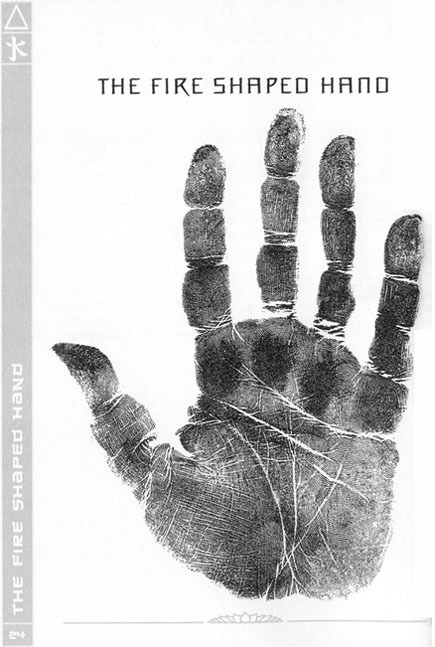 The palmar dermatoglyphics are discussed in two chapters - Palmar Dermatoglyphics and The Palmar Glyphs. The first chapter deals with manifestation of the so-called 'triradius' in the various zones of the handpalm. The second chapter deals with the 10 classic palmar dermatoglyphic patterns - including: the 'humour loop', 'style loop', 'serious intent loop', 'charisma loop', 'courage loop', 'Bee', 'music loop', 'memory loop', 'nature loop', and the empathy loop. And quite a few other less common variants are also described - all featured with excellent high quality visual examples. NOTICE: While quite a lot of the typical characteristics of the four 'elemental hand types' can sometimes be observed in one single person, far most people have a mixture of elemental characteristics. For example: while the 'water shaped hand' example does have 5 'ulnar loops' and the 'air shaped hand' example has 3 'whorls' (actually: one is a 'double loop') + 2 'ulnar loops'; the 'earth shaped hand' example has only 1 'arch' + 4 'ulnar loops', while the 'fire shaped hand' example has 3 'arches' + 2 'ulnar loops' ... so it has no 'tented arch' at all. PHOTOS: Impressions from the 'Five Element Chirology'-course by Jennifer Hirsch. Besides offering a guide to identify and interpretate your fingers, the book also provides a guide to learn the basics of how to read hands. In the chapters: The Hands various hand features are discussed (including: skin texture, mounts, nails & fingers). And in the chapters Going Deeper and Counseling Hirsch describes e.g. 'How to create a hand chart? ', the role of 'Intuition', 'The magic in the telling', and she present guidelines for 'Giving readings'. In various sections of the book Hirsch also makes a some comments that relate to insights described by academic scientific research. The famous example of Down syndrome (e.g. single palmar crease on fifth finger + high positioned palmar axial triradius) is mentioned, and Alzheimer disease (predominance of ulnar loops) is described as another example. Because the scientific details (+ references) are missing, it would be one bridge too far to say that 'God Given Glyphs' hooks in with scientific research. But Hirsch does show with about 200 excellent handprint illustrations, that she is very aware of what is going on in the hand. She speaks about "infinite variables of forms and markings", but she has managed to describe in her book the basic dermatoglyphic elements with great care + detail in a very sensible format. Hirsch's book ends with a short History of fingerprinting - this historical treatise starts in 300 B.C. but unfortunately it does not continue beyond in the first half of the 20th century - with a reference to the work of the dermatoglyphic expert Harald Cummins (1894-1976). * In academic science there are quite a few obscure scientific sources available which have brought the science of dermatoglyphic classification a few steps further (e.g. B. Schauman & M. Alter, 1976: Dermatoglyphics in Medial Disorders - A. Rodewald & H. Zankl: Hautleistenfibel - D.Z. Loesch, 1983: Quantitative Dermatoglyphics). JENNIFER HIRSCH is the devoted founder of the hand reading school 'CHIROLOGY CENTER OF SOUTH-AFRICA' - the activities are focussed on the practice, promotion and teaching of consciousness & spiritual awareness through the hand reading system named: 'Five Element Chirology'. "My first handreading teachers and mentors were the late Brian Friend, who taught me palmistry, and Christopher Jones from the ex British Cheirological Society, who wrote and administered the home study training course that gave me a thorough grounding in the principles of five element chirology." 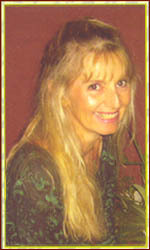 "I founded the Chirology Centre of South Africa when I began studying hands in 1991. For many years I read people's hands and taught chirology in Johannesburg. The content of my ebooks 'Healing Craft' and 'Traits of Being' evolved out of the training manuals I compiled over 12 years of teaching people how to read hands. The idea for my book 'God Given Glyphs' first came to me in 2004 and it took me five years to write and compile." Jennifer Hirsch presents at her website godgivenglyphs.com also three ebooks about 'Five Element Chirology' - based on her earlier experiences in the field of modern hand reading. via the PRODUCTS PAGE on her website. without cross-referencing for all other palmar indicators." capacities and trends you are building up." HAND DIAGNOSTICS - PART 1: The simian line, a notorious hand crease! HAND DIAGNOSTICS - PART 2: The Sydney line, an underestimated hand crease! HAND DIAGNOSTICS - PART 3: The 5th finger, never underestimate your pinky! HAND DIAGNOSTICS - PART 4: The nail tutur, find the cause of your nail disorder in 4 steps!